Dublin City Council now has arrears of over €20 million as a result of residents not paying rent, and says there is a “culture of under-declaration of income”. THE DUBLIN CITY Council Manager has put the blame for a drop in rents collection on residents, saying it is due to a “culture of under-declaration of income”. The comment was made in the most recent Audit Report for the local authority for 2012, where it was noted that the collection of housing rents had dropped 2 per cent in one year, from 79 per cent to 77 per cent. The Council now has arrears of over €20 million as a result of failing to collect housing rents, which City Manager Owen Keegan said was mainly due to the residents. The primary reason that the arrears are €20.6m is as a result of a culture of under-declaration of income and failure to report changes in circumstances. Of the amounts owed, the vast majority (€18.6 million) is owed by those who have been in arrears for 6 months or more, despite making up less than half of the total number of people (46 per cent). Dublin City Council’s rent assessment policy is to apply retrospective debits to accounts where there has been an under-declaration of household income/occupants. The implication is that each household will have their rent assessed every two years and from 2014 it is anticipated that there will be no large back-dated debits as accounts will be up to date. Dublin City councillor Christy Burke was critical of Keegan’s remarks, saying: “A comment like that doesn’t help. Sometimes these things happen, in my experience it is usually not done intentionally”. “City council tenants are no different to people having difficulties paying mortgages, although the amounts are very different”. “I had a woman ring me up the other day who was having to put water into the milk in her cornflakes, that’s the way it is for many people, it’s either the dinner or the rent”. The drop in rates is the first for the council in three years. The last drop was reported in the 2009 Audit Report, when collection rates went from 83 per cent to 79 per cent. The collection rate for Dublin City Council hasn’t increased in four years and is the second lowest collection rate among the city councils, just ahead of Galway City Council which has a 76 per cent rate. Limerick City has the highest collection rate of any city council at 92 per cent. 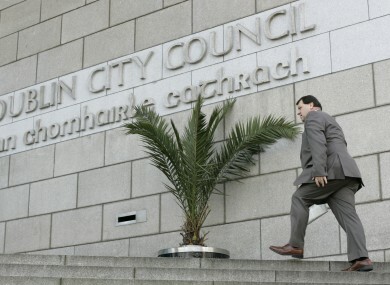 Dublin City Council declined to comment further on the issue when contact by TheJournal.ie. Email “Dublin council blames tenants for drop in rent collection”. Feedback on “Dublin council blames tenants for drop in rent collection”.